Just in time! There are still a few blossoms on the trees today, but by Thursday I think they'll be all gone. Looks delicious. It is SO BEAUTIFUL. Yet...does it taste as fantastic as it looks? I like the texture of the top layer. Very feathery and light. Looks just like sakura petals on top... Beautiful! Oh wow, how pretty! I just love wagashi... Unfortunately, we had a bout of freezing weather and our cherry blossoms got a little brown and wilted. 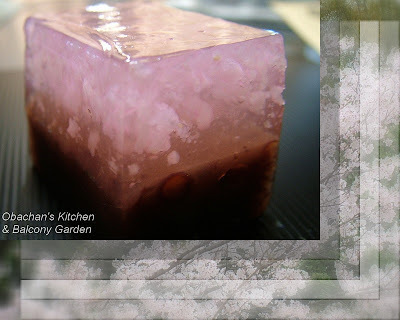 This wagashi reminds me of when the flowers were still light pink! It's beautiful ^^. It just looks like the personification of Serenity or something. You're really creative! Well, to be honest, I was expecting to taste a little cherry blossom flavor from the pink stuff in the top layer, but the whole thing tasted just sweet, which was a little disappointment. Yeah, I’m back! ;) No, no, the date hasn’t been changed. I’m still waiting. Right. I wonder how they make it look like that. Ah, sakura lovers everywhere! :D I love many kinds of flowers, but I have to admit that I can’t help having a special feeling for sakura. Mmmm… brown cherry blossoms must be something sad to see. Looks like the weather was a bit strange in many areas this spring.